Africans of different culture, class, status and stature descended in their thousands upon Lagos, Nigeria on Friday. 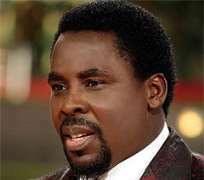 They had come to see one man: TB Joshua - the controversial and celebrated Nigerian cleric whose authenticity and authority has been the source of heated debate and dispute across the continent. The vast auditorium at The Synagogue Church Of All Nations, which has played host to worshippers and visitors across all social strata, ranging from heads of state and kings to the hungry and the homeless, was packed to capacity with overflow structures erected to accommodate the masses outside. People came with a variety of ailments ranging from the deadly and incurable to the desire for breakthrough and breaking of curses. The atmosphere was intense and expectant before the pastor humbly walked out amid fierce applause, obviously revered and respected by all. Welcoming them to 'the arena of liberty', he proceeded to bemoan the effects of unbelief, saying: 'Negative confession brings wrong possession.' He then exhorted all to believe that a touch from God is all they required, telling them to prepare for a life changing testimony. Wild cheers followed. Thus, the time of healing began. A dramatic scene unfolded as spontaneous cries for help amid wild shouts of joy echoed throughout the vast auditorium, applause rippling impulsively among the attentive onlookers. With a seemingly endless energy, Joshua prayed individually for each of the thousands of attendants, who were all arranged in many circular rows in the middle of the church, according to their ailments. Some cried, some fell, some remained still, some rolled uncontrollably under divine influence. 'A touch from heaven is all you need' admonished the pastor. From mental disorders to diabetes, arthritis to asthma, barrenness to breakthrough – the prophet touched them all, and instantaneous testimonies ensued. “When the man of God touched me, it hit me like a bullet in my chest, and I fell down. As I got up, all the pains suddenly disappeared” said James Okapede, a Ghanaian with a debilitating spinal disorder. Mrs Philomena from Delta had diabetes and fibroids for over 2 years. “Immediately when the man of God touched my head, I felt some peculiar feelings within – and I knew something had happened to me. Now I can walk properly. Emmanuel!” Her joy was boundless. Mrs Mary brought her mentally deranged son Ikechukwu from Adamawa State in the north of Nigeria. “He used to fight and beat people, and destroy their properties” she explained. Chained and with a wild glint in his eyes, the crowd looked on as TB Joshua instructed her to release him from his chains. He walked calmly away with his jubilant mother. After almost 6 hours of solid prayer broadcast live on Emmanuel TV, Joshua invited everyone to come back the following Sunday to share their testimonies.